I’ve finished covering the background in the new drawing. I’ll wait until the figure is completed before deciding if the background needs any adjustment. I rather like the texture so I’m not in a hurry to change it. Enough with the holiday laziness. 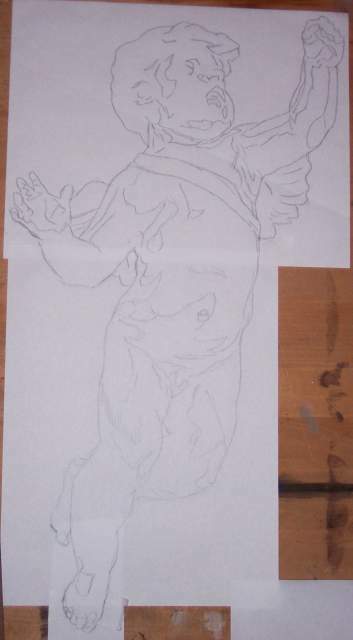 I’ve started a new ink drawing, humorously playing with a baby angel idea (blame the left-over Christmas spirit, if you will.) This comes from a bronze sculpture by the Belgian artist Francois Dequesnoy, according to my notes. The sword will be my own addition. 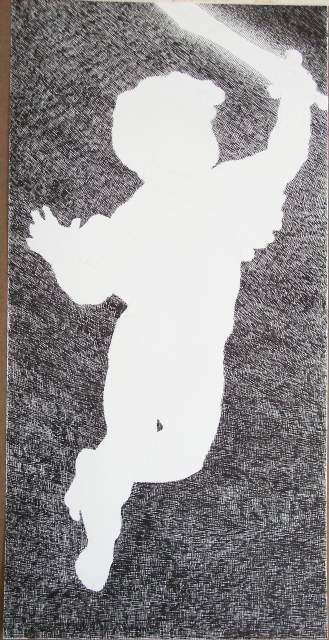 The drawing surface is a 12 x 24″ thin sheet of birch veneer coated with a hand-made shellac primer. I’ll need to go back and adjust the background value at some point to get a better gradient, but for now I just need to get it covered evenly. 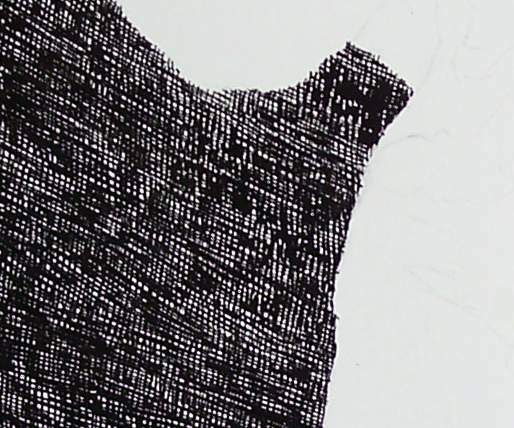 You can see here the stages of cross-hatched layers I’ve built up so far. I’m using India ink (Pelikan) and a Hunt #512 pen nib. 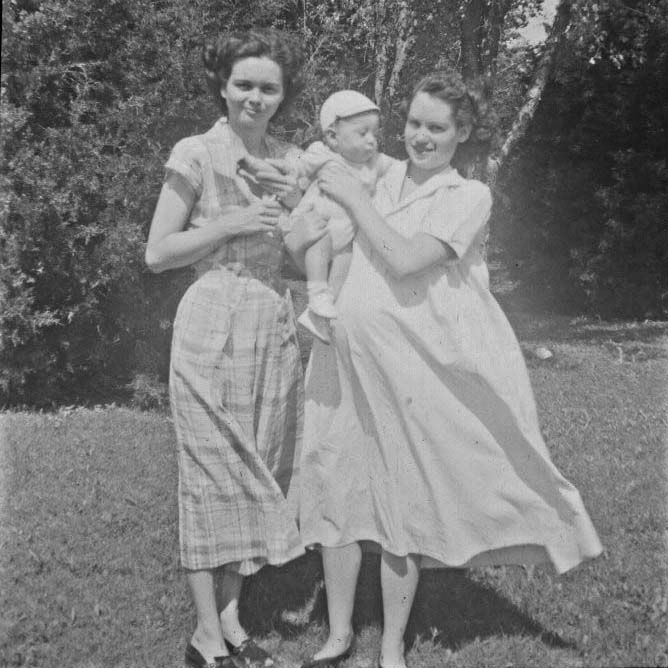 I found a couple boxes of black and white negatives in one of my Mother’s cabinets. 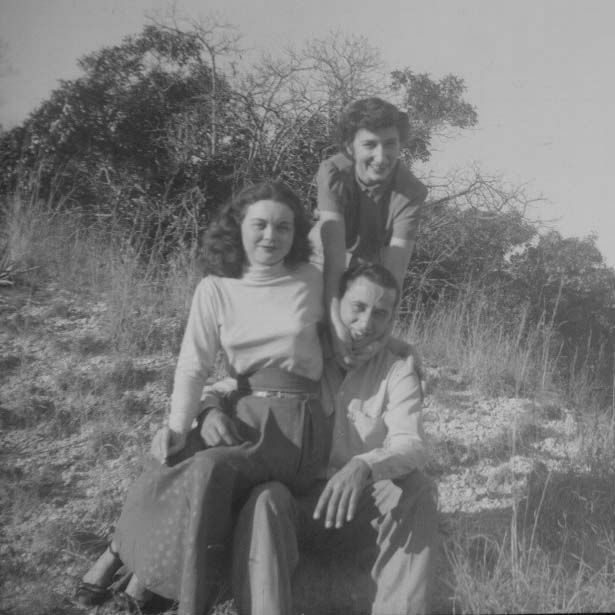 Some are photos that I’ve never seen before so I’ve been spending the last few days scanning them using the method I posted awhile back. These are from the early 1950s. The holiday has been keeping me hopping and distracted lately, but here’s a post to hopefully tide you over for a little while until I can back to the drawing board. 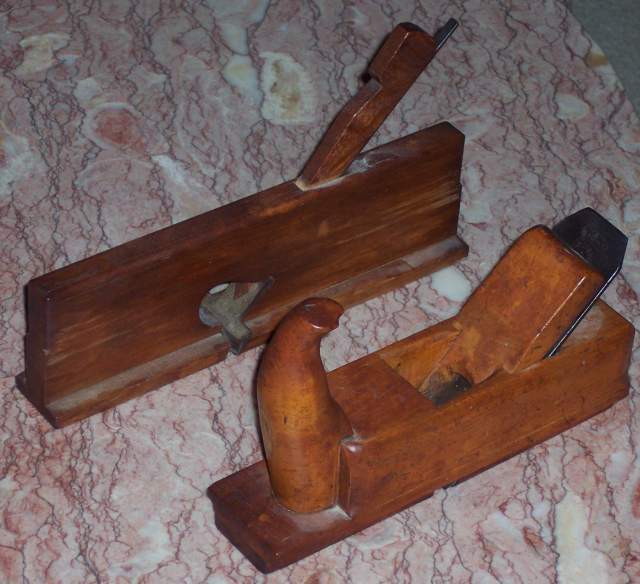 These are two antique wood planers of my father’s. The blades need sharpening but they both are in excellent shape otherwise. Thanks, Dad. I’ll take good care of them. 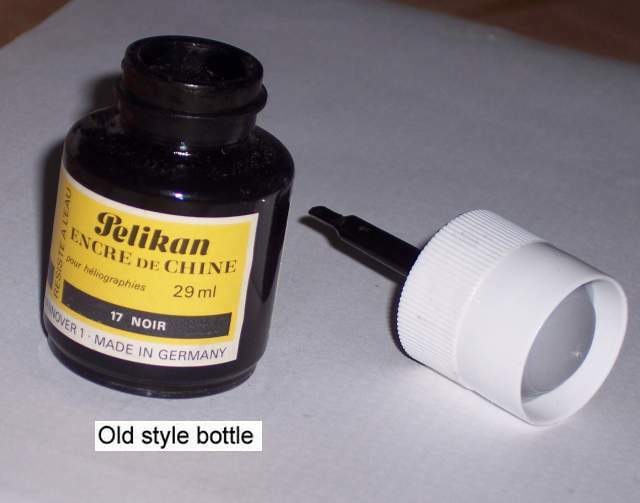 In a recent post about problems I discovered with some ink bottle caps, I praised the design of my old Pelikan brand of drawing ink, specifically their Drawing Ink “A” Black #17, which happens to be my favorite brand. After all of the drawings I’ve been doing lately it was time to buy more, and when it arrived I discovered they’ve made a curious change to their bottle design. On the previous bottle design the cap had the same cylindrical shape, but they had switched from a glass bottle to a plastic one. Not liking that change, I poured the new ink into the old glass bottle and threw away the plastic one. At first I thought this tip was permanently attached until I wiggled it off. It popped off and ink drops flew everywhere, so I’d suggest not removing it near your artwork. 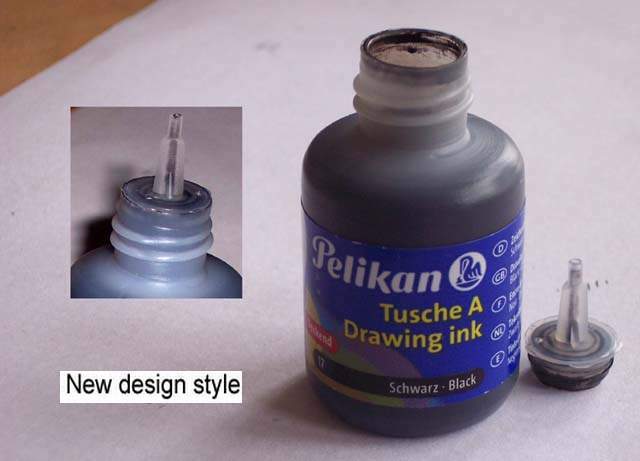 It snaps back in easily, and to squirt out ink you just squeeze the bottle. The opening is also smaller than before. My bamboo pen won’t fit all the way inside, but all my other penholders and brushes will. I’m not very fond of this change, but it is a clever design. The tip feels kind of flimsy and I’m afraid it’s going to break when I remove it. I’ll likely just keep the tip off altogether, or empty the ink into the old glass bottle as before. I also wanted to show one of the reasons why I like this ink so much. It’s a nicely dark black India ink that isn’t as thick as some other brands and holds up well when diluted for washes. 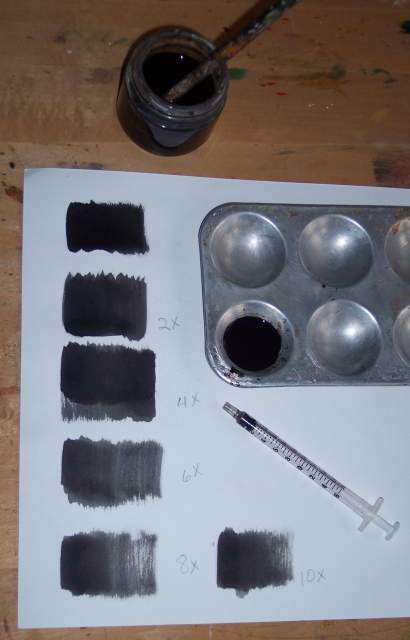 In this image above you can see the result of the ink being diluted by ten times the amount of water, and the value only dropped a couple of notches. I like to use a syringe to measure my water volume so I can accurately measure the volume of ink and water. Christmas came a few days early today when I received my order of DecoColor Opaque Markers. Unlike the acrylic markers I reviewed in my previous post, these are oil based. I picked out just three colors to test out in various point styles. 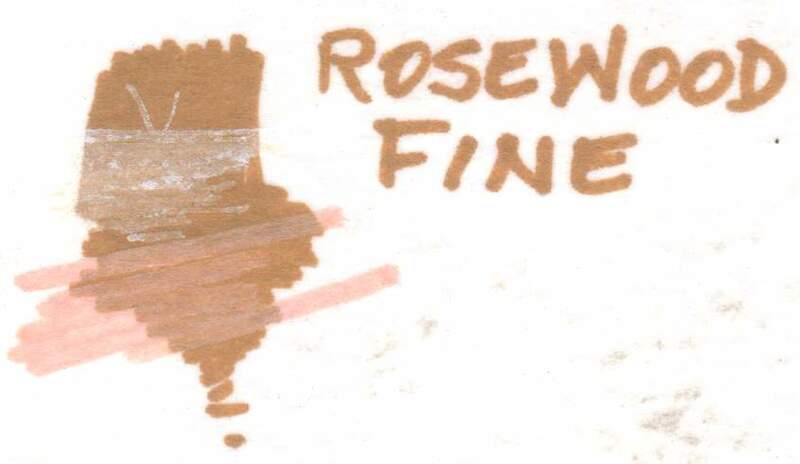 The white has an “extra fine” point, the Rose Wood is “fine,” and the pastel peach is “broad.” Like the other markers these use pigmented lightfast ink. The only instructions for these markers is to shake before using, and be sure to keep the cap on when you do or drops will fly all over the place. The ink also doesn’t wash out easily. They use Xylene as the solvent, so be sure to use in a ventilated area. Are they opaque? Not so much, no. As you can see in the scan on the left I’ve laid down the rose wood color first, and then drew over this with the white and peach colors. The color stays transparent here. I can build it up some with more layers, but it doesn’t get that much more opaque. By the way, I’m using a 300# watercolor paper that accounts for the uneven texture seen in the white color. On the peach color, the white covers a little better as does the darker rose wood. I should also mention that the ink dries immediately. 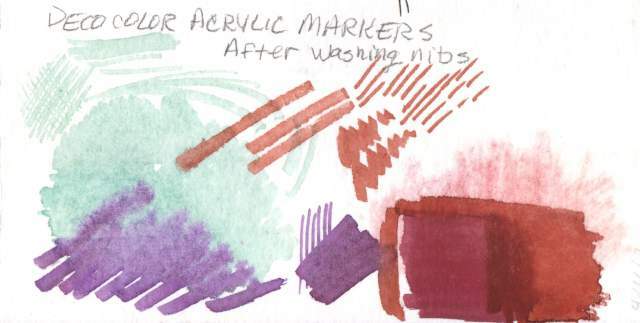 Notice here how well these inks work on top of the DecoColor Arylic Marker (this is the English red color.) A single coat covers better here on the acrylic than on the oil markers, but is still transparent. They’re useful, just not all that opaque. Also in this scan you can see some marks made by a .005 Micron marker on the left side (slightly dried out) and a Hunt 512 pen nib point. The “extra fine” is about the same width as the .005 Micron. I would expect the DecoColor black to be nicely dark, so I’ll have to get one of those soon as well. A friend of mine recently suggested I take a look at this line of markers that uses acrylic paint. I became even more interested in them when I discovered they were made by the Marvy/Uchida company, who also make a line of pigmented markers called “Le Plume” that I’m very fond of. 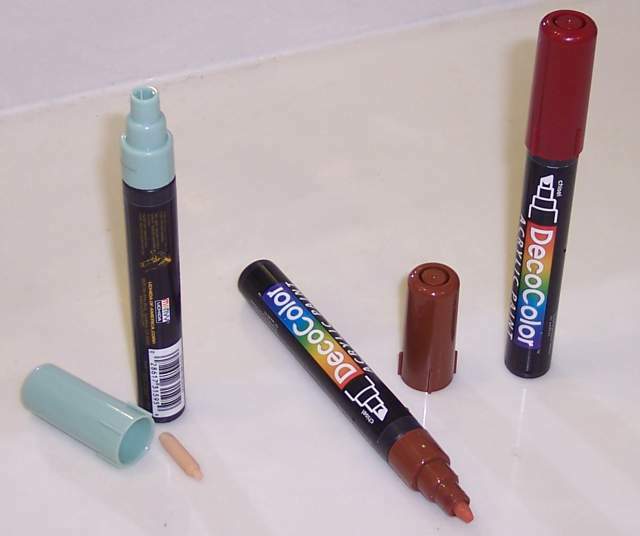 DecoColor comes in a variety of types and point shapes. These happen to be acrylic based, but they also have a version that is oil based. The acrylic ones only seem to be available with chisel point and “jumbo” wide tip nibs, whereas the oil ones (called “Opaque Paint Markers”) come in three different sizes. I have the oil based ones on order and plan to review them later. 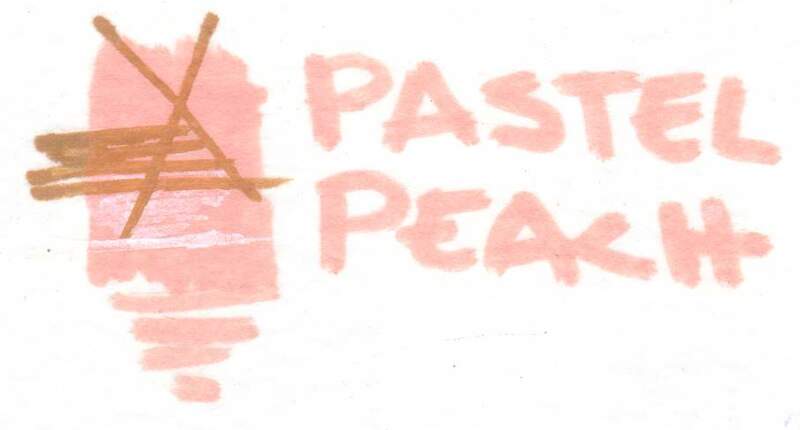 Here, I picked up just three acrylic markers to test out: “brown,” “English red,” and “celadon” colors. They are pigmented markers, but there’s no mention of exactly what pigment is used. The description also states “acid-free” and “lightfast” which is good. On the side of the marker is printed some instructions of a sort, but the print was so small I had to scan the marker to read it. “Shake with cap on. Press down until color appears.” It’s rare to have art materials that come with instructions. Okay, so I gave one of them a good shake (there’s a small ball inside like inside a paint can,) pressed down for a few seconds until the paint began to appear on the nib, and started making marks. By the way, as I discovered later, when you’re shaking it be sure and leave the cap on. In the example above the marks were very solid and opaque with all three markers. They dried to the touch in only a few seconds. I then wanted to see how well they stood up to water, so I washed over them with a wet cotton swab. I then saw that the paint immediately broke down into a wet wash. At first the paint was only slightly disturbed but the more pressure and water I added caused the paint to almost completely disappear. This is not necessarily a bad thing, and can in fact be quite useful. If the surface is damp the paint will spread like watercolor, but it won’t flow as it would from a brush filled with paint. I discovered a couple days later that the opaque paint was a little harder to remove with a wet swab but still not what I would call “water-proof.” That opinion changed, however. Other instructions on the side say “Store in a horizontal position, Clean nib when finished, Make sure cap snaps on properly, Store at room temperature” (I’m paraphrasing.) Storing them upright will be a bit awkward since they’re easy to tip over and I don’t really have a good place for them, but I’ll see what I can manage. Cleaning… hmmm. It doesn’t exactly say how to clean them, but I figure that should be easy enough with water alone. When I take them to the sink I discover that the nib easily pulls out of the base. This makes the cleaning even easier. 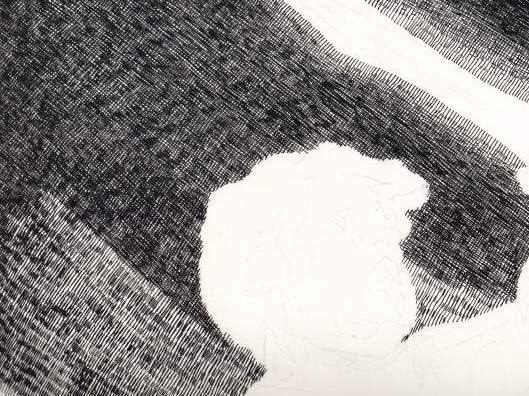 I hold each nib under running water until the water is clear, dry the nib on a paper towel, and insert it back in the base. Simple. The next day I wanted to test these out by using them for underpainting of oil based paint. That’s when I discovered something interesting: the paint coming out of them was no longer as opaque as it was the first time I tried them. 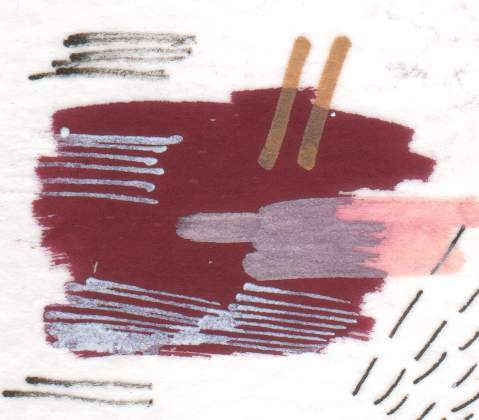 Now the marks were much more transparent, like thin watercolor. I actually prefer this now than with a more opaque flow. You can over-paint when the marks are dry, but I wouldn’t try to get it too thick since the binder is so weak. See that purple color above? That’s actually the English red. Apparently this marker is a mixed color and the pigments separate, so be sure and shake well before use, and test it out beforehand. When the paint is still damp you can make marks into it that will spread and stain, like in the blue-green “celadon” color above, or you can paint onto a damp surface and get a similar effect. I also discovered that these new marks do not erase nearly as easily as the first opaque marks did the day before. You can see the result of my scrubbing on the brown area above. Some color lifted, but not very much. As with other markers that claim to be water-PROOF I would more accurately decribe them as water-resistent. I’m not sure if the cleaning method I used to hold the nib under running water is the way the manufacturer would recommend doing it. That’s likely what has caused the paint to now come out more transparent, but I like it that way. It also causes less paint to come out, but I wind up washing paint down the drain. I’m wondering if it might be better now to just wipe the tips rather than wash them? I’ll try to contact Ushida for an offical response. Finally, my oil over-paint tests went well on these arcylic markers. Oil paint adheres well when the marks are as thin as these. Acrylic paint also works well without lifting, even when the fresh paint is wet. If the markers are used in a more opaque manner, I wouldn’t recommend over painting it unless you do so with other marker colors. The paint these lay down just would not be strong enough otherwise. 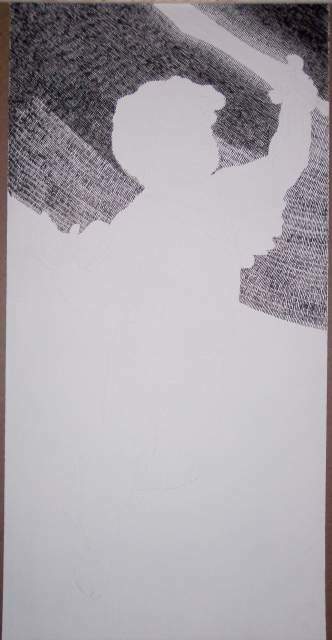 You are currently browsing the Artwork by D. B. Clemons blog archives for December, 2011.